While living in California normally guarantees good weather, we know that isn’t always the case. When a storm and subsequent flash flood strikes, it can take weeks to recover and bring things back to the way they were before. If you have had flooding in your home, regardless of whether it’s from external factors or from an issue within your home, contact SM Absolute. 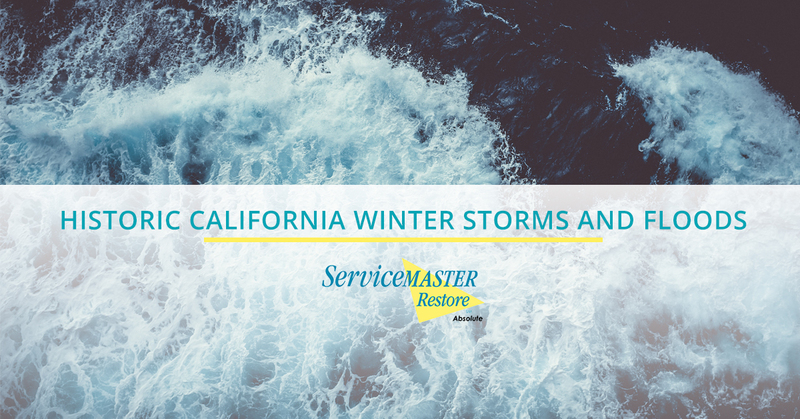 Our professionals have been trained to work within your San Diego home and reverse as much of the water damage as possible. Read on to learn more about some of the most damaging storms in California’s history that we have on record. Some have changed the way the state prepares for serious weather conditions and others have even altered the landscape. While no one currently living is old enough to have survived this flood, it remains the worst flood in California’s history that we know of. Both rain and snow began all across the west coast in December of 1861, and before long, it served as the beginning of the Great Flood. After record rainfall in January, it soon became apparent that this would be too much for the rivers and streams that stretched all the way from Oregon to San Diego. After a warmer storm melted a snowpack, even more water ran into areas that had already been flooded. In 1909, all of the major rivers in the Sacramento Valley flooded. This meant that the engineers of the state had to take a closer look at California’s way of handling floods and preventing them. Previously, they had used a Midwestern technique which entailed keeping the floodwaters between levees. Bypasses and overflow weirs had both been rejected when proposed before. On February 28, a storm brought rain that only grew stronger over a five day period before leaving Southern California. Los Angeles, and Riverside County were all left devastated from the storms. Roads, homes, bridges, and businesses were all toppled over as the rivers filled way past the level of their banks. Over 100 people died from the flood. A hurricane lessened its severity before it hit the shore, so it technically became a tropical storm. However, it was still strong enough to cause a serious amount of destruction. With winds of over 50 miles per hour and almost six inches of rain to Los Angeles in just 24 hours, it proved to everyone just how unprepared California was to handle such a tropical storm. There were 45 deaths reported after the storm passed. Over 70 deaths occurred because of the flooding that happened in northern and central California just days before Christmas. Officials declared the flooding a statewide disaster once the water in the rivers began to overflow their banks. It is estimated that there was about $200 million lost in economic damages. A series of storms left behind about $300 million in losses and almost 50 deaths. Because of the flooding that wreaked havoc in Central Valley and the San Joaquin Valley, the engineers of California made it a point to reform the Tulare River and prevent a future emergency like this one from happening again. For a few days, there was both rain and snow coming into California. The coastal areas were hit hard, but the storms also led to flooding in Valley areas, as well as mountain landslides. These storms made a record for the rainfall in the Sierras, but the water led to snowpack melting and water poured into the rivers—rivers that were already overflowing. Californians became more aware of the impact El Nino has on the weather, so reservoir releases were used during the 1997-1998 El Nino. There were 36 deaths reported afterward, and more than 6,600 homes were completely destroyed in the storm. After the rainstorms just wouldn’t stop across the Monterey Peninsula, the peninsula was no longer accessible to the rest of the California coast. It was entirely cut off due to excessive flooding. The Salinas River increased past its previous record by nearly four feet. This downpour led to about $1.8 billion in economic losses, and 28 people lost their lives during this tragic storm. Both rain and snow began falling in central and northern California beginning the day after Christmas and continued until January 3rd. The worst downfall, however, happened on New Year’s Day. The Yosemite Valley flooded for the first time in over 100 years, and the flooding didn’t stop even after the storms themselves did. The rivers still overflowed, the soil loosened and led to landslides, and most of northern California was declared a disaster zone. There were eight deaths reported. These storms appeared after nearly six years of a dry spell. At the end of January and the beginning of February, a series of storms caused serious flooding in San Jose. This caused Coyote Creek to overflow, and as a result, over 14,000 people had to evacuate their homes to remain safe from the damage. If another storm like one of these strikes us again, we can help. The professionals at SM Absolute know just what to do when a storm hits and how to clean up the subsequent flooding. Please contact us when you need us, as we can be there within the hour! We look forward to helping you and your family.